Disconnection is a practice in Scientology, in which a Scientologist severs all ties between themselves and friends, colleagues and/or family members that are deemed to be antagonistic towards Scientology. If an individual attempting to improve his life through Scientology is encountering persistent opposition from a close associate, his spiritual advancement is impeded. In the vast majority of cases, the antagonism is rooted in false information about Scientology and providing the true data ends the matter. As a last resort, when all attempts to sort out such situations have failed, the Scientologist may decide to disconnect from the person until the antagonism ceases. – Source: What is “disconnection? Scientology Press Office, Scientology Today. See screenshot for version archived by the Internet Archive. That official explanation used to be posted at Scientology’s Press Office website. The cult‘s press office tried to compare ‘disconnection’ with the practice of shunning found in some religions, such as the Amish or “certain Orthodox Jewish congregations” and Jehovah’s Witnesses (considered a cult both theologically and sociologically). It should be noted that shunning is not a Biblical practice. (See: What the Bible Teaches About Shunning). While the Bible does talk about a disciplinary practice currently referred to as excommunication or disfellowshipping, the practice was never meant to be applied in the extreme forms used by some movements. The official explanation of Scientology’s disconnection policy has been removed from its original URL, but can be seen in the screenshot above). In its place is a wordier version of “What is Disconnection?” now published by the ‘Scientology Newsroom’. (Consumer Alert: That link leads directly to a website operated by Scientology). There is no policy in Scientology that requires Church members to disconnect from anyone, let alone family and friends who simply have different beliefs. To the contrary, the moral code of Scientology mandates that Scientologists respect the religious beliefs of others. The Church encourages excellent family relationships, Scientologists or not, and family relations routinely improve with Scientology because the Scientologist learns how to increase communication and resolve any problems that may have previously existed. When film director and screenwriter Paul Haggis resigned his membership in the Church of Scientology, he did so in a letter to Tommy Davis, who at that time was Scientology’s chief spokesperson. The practice of shunning, which Scientology used to try and hide behind, was certainly never meant to break up families — as is the case with Scientology’s disconnection policy. Disconnection has sometimes ended marriages and separated children from their parents. Another Scientology policy – called “disconnection” – forbids Scientologists from interacting with a suppressive person. No calls, no letters, no contact. An SP is a pariah. Anyone who communicates with an SP risks being branded an SP himself. Scientology founder L. Ron Hubbard wrote the policies four decades ago, church leaders say, not as a tool to oust members but to provide those going astray with a mechanism to return to the church’s good graces. That aligns with Scientology’s tenets of improving communication, strengthening relationships. But SPs who have felt the sting and other church critics say the suppressive person policy is a sledgehammer to keep marginal members in line – and in the flock. Whatever Scientology’s motivation, its suppressive person policy results in wrenching pain, say a dozen SPs interviewed by the St. Petersburg Times. Some have gone years without seeing or talking with sons, daughters, mothers, fathers – all of whom abide by Scientology’s no-contact requirement. For a Scientologist thinking of forsaking the church, the decision is grueling: stay in or risk being ostracized from loved ones and friends. The father of cult leader David Miscavige exposes Scientology’s cruel disconnection policy in his tell-all book, Ruthless. The author of a controversial new biography on celebrity Scientologist Tom Cruise has found an unexpected new ally: the niece of Scientology’s current leader, David Miscavige. In an open letter to a senior Scientology official that has been widely posted on the Internet, Jenna Miscavige Hill described how her own family was broken apart by the movement’s policies. Hill’s father is Ron Miscavige, the older brother of David Miscavige, the current leader of the Church of Scientology. “Hell, if Scientology can’t keep his family together — then why on earth should anyone believe the church helps brings families together!” she wrote. In particular she challenges Scientology’s denial that it puts pressure on members to break all contact with relatives who do not support the movement — a practice known as disconnection. Hill said it was this policy that broke up her own family. “As you well know, my parents officially left the church when I was 16 in 2000,” she wrote. Having been separated from them since the age of 12, she decided not to go with them. Hill goes on to detail how Scientology officials intercepted letters from her parents and her friends. She was only allowed to visit her parents once a year for a maximum of four days, she wrote — and then only after her parents threatened legal action to get access. When she returned from these visits, she was questioned to see if her parents had said anything bad about the movement. Jenna Miscavige Hill, niece of Scientology leader David Miscavige, talks about Scientology. That’s the view of many religious scholars who say the motive behind Scientology’s suppressive person doctrine is clear: keep members from breaking ranks. Scientology’s disconnection requirement is far more extreme than the severing practices of most modern religions, Melton said. Scientology’s disconnection policy is but one of many aspects that make the movement a destructive cult. ABC “20/20” – April 29, 2016. Ron Miscavige, father of Scientology cult leader David Miscavige, talks with ABC about his son’s rise to power — and how Scientology’s disconnection policy has torn apart his family. Ron Miscavige is the author of Ruthless: Scientology, My Son David Miscavige, and Me. Scientology Disconnect Policy Destroying Families Documentation of the practice and effect of Scientology’s disconnection policy. The Unperson [Newspaper] Robert Farley, St. Petersburg Times, USA, June 25, 2006. “Scientologists who cross their religion can be declared suppressive persons, shunned by peers and ostracized by family.” See also: SP Profiles This sidebar to the above article takes a brief look at three people declared ‘Suppressive Persons’ by Scientology. What is “disconnection?” [Pro] Consumer Alert: Connects to a website operated by Scientology. Article in the “Answers to questions most commonly asked by media” section of Scientology Today — a website of Scientology’s Press Office. 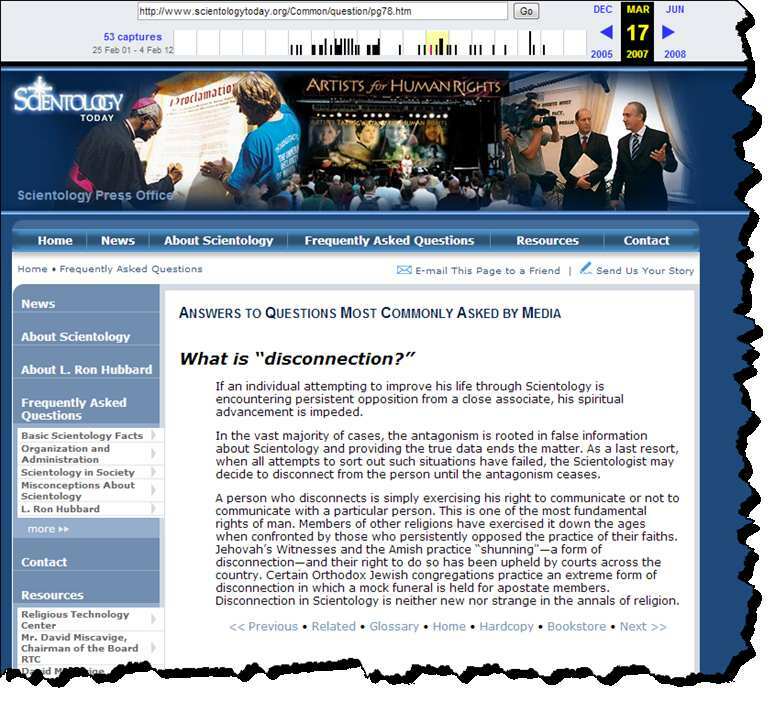 Disconnection Collection of articles at the Scientology Lies website documenting the cult’s disconnection policy. Do you have loved ones in the Scientology cult who have disconnected from you? Use these printable posters and flyers.